PHOENIX — After taking his first few months in office to think it over, Maricopa County Sheriff Paul Penzone announced Tuesday that the controversial Tent City jail would close. “Starting today, the circus ends and the tents come down,” Penzone said at a press conference announcing the news. Penzone said closing Tent City should save the county about $4.5 million per year. It cost about $8 million to $9 million to run the jail annually. The more than 700 prisoners in the jail will be transferred to either the Estrella or Durango jails. Penzone said some of the population would be moved in the next 45 to 60 days, but it could take months for a new work furlough system to be worked out. About 86 people work at Tent City. Penzone said there would be no layoffs because of the closure. “It seemed to me the majority were very supportive and expected this was coming for some time,” he said of their reactions. It will take about six months to decommission the jail. The tents will be stored, donated or thrown away depending on their condition. Penzone has been mulling the Tent City situation for months. He formed a 12-person committee — none of whom work in law enforcement — to make a recommendation on the future of the jail. The committee reviewed data on the jail, interviewed Maricopa County officials and toured the tents before making its unanimous closure recommendation. Even though Penzone has been vocal in the past about closing the controversial jail established by six-term predecessor Maricopa County Sheriff Joe Arpaio, he insisted in an interview with KTAR News 92.3 FM’s Mac & Gaydos that his decision was not influenced by the former lawman. “When you see something is done well, you want to improve on it,” Penzone said. When you see something that has gone poorly, either you get it straight or you get rid of it. As for the inmates themselves, Penzone said they actually prefer the openness of Tent City compared to the confined, cold space they would get in a jail cell. “We’re going to give the criminals what they don’t want, which is detention inside jails and isolated areas that are more safe for our detention officers,” Penzone said during Thursday’s press conference. Tent City was opened in 1993. The jail has a maximum capacity of 2,000 prisoners. The jail, which is primarily used to house low-level offenders such as those found guilty of a DUI, was deemed inadequate by Amnesty International in 1997. During a 2003 heatwave, temperatures inside the tents hit 145 degrees. 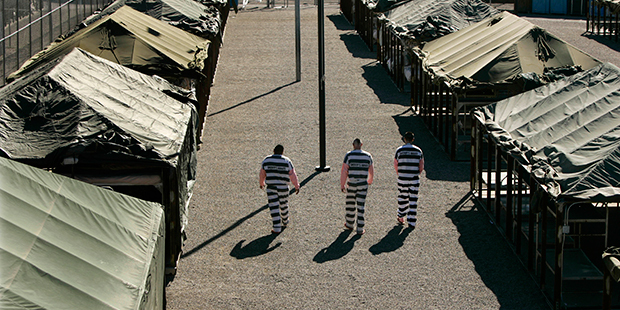 Arpaio told inmates to quit complaining about the heat. “It’s 120 degrees in Iraq and the soldiers are living in tents and they didn’t commit any crimes, so shut your mouths,” he was quoted as saying. No deaths were ever reported at the jail.